“There is no truer statement: men are simple.” So begins the first chapter of Steve Harvey’s Act Like a Lady, Think Like a Man. Men are driven by “who they are, what they do, and how much they make,” according to Harvey, and will not put a relationship first until they’re first satisfied with all three. Women need to understand this and stop reading books by women who don’t and whose solution is to suggest that men need to be more like women. That’s a dead end. Men’s love isn’t like women’s love. Men will profess their love for you (if they’re really serious), they’ll provide, they’ll protect. In return women need to support their men, be loyal, and not be stingy with “The Cookie.” It’s like the sexual revolution, feminism, and perhaps modernity itself never happened, except that women—now too free with The Cookie and believing that men really could act more like women—are now at a disadvantage in the war of the sexes. Harvey proposes to give away mens’ battle plans (the traitor!). The main counter-strategy: women, you can outflank men by becoming ladies again—or at least pretending to. The book is old-fashioned and ultra traditional to the core. Are men really that simple? The “who they are” part is vague enough to allow for some subtlety to creep in, but much of my experience confirms what Harvey says. I once belonged to a “marriage enrichment” group, but without our wives it was a struggle for us men to talk about anything but our jobs. And sports. One of the men—in what I see now as an act of incredible social bravery—quit the group, admitting that he felt inferior, job-wise, to the rest of us. I belonged to another men’s group formed after a religious retreat. Almost the same result. I wonder how much men have ever changed. 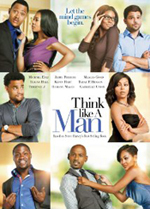 Though the movie Think Like a Man is little more than a two-hour commercial for Act Like a Lady, Think Like a Man, I found it surprisingly enjoyable, perhaps because it rang true to my experience of being with men trying to be more modern, more feminine, less cave-mannish, or at least careerist. Six guys meet to play basketball three times a week, and their aggressive, but natural, jovial friendship made a totally predictable movie pleasant. Everything works out with cloying neatness: the “Player” stops playing, the “Mama’s Boy” escapes, the “Non-Committer” commits, the “Dreamer” gets to keep dreaming when his dream-killing girl friend becomes supportive and loyal. (She always gave him cookies.) Even the loud-mouthed one going through a divorce finally admits the emptiness of the swinging single life and goes back home. I dedicated one of my recent books, Black Writing from Chicago, to the great poet and community activist Haki Madhubuti, and used excerpts from his book Black Men: Obsolete, Single, Dangerous? In the chapter titled “Not Allowed to Be Lovers,” he says that, “Sound and loving relationships are the core of a sane, happy and fruitful life,” but—as the chapter title suggests—black men and women aren’t “allowed” to be this. Madhubuti says, essentially, that black men are trying to model themselves after white men and white definitions of success and the virtual impossibility of that working out in a still-deeply racist society results in frustrations that poison relationships with “the most gross forms of competition, decadent individualism and sexual exploitation.” It’s a deeper, more sociological perspective than Steve Harvey’s, but a lot of the outcomes are the same, and these relationship failures are one of the major factors leading black men towards obsolescence, singleness, and being inextricably associated with danger. In Think Like a Man there are two white guys in the group, though one of them fancies himself at least culturally black. Also, his significant other is black. The other white is stereotypically big and white, but he’s the only one who seems to have it together relationally. He seems happily married. If he promises to be home to cook or watch the kids that’s what he does, and no amount of ball-and-chain man-kidding phases him. He may represent a subconscious suggestion that white relationships are better, though we never actually see his wife, the movie totally erasing her. Though Steve Harvey, black and extraordinarily popular with American blacks, may not mean this at all, he may still be taking aim primarily at black men and the black women they fool. The focus on black women needing to be more lady-like, plus the fact that the other white man’s black girlfriend is bigger than he is, and the loud mouth’s black wife is way bigger than he is (she drags him away by his shirt collar near the film’s end) could suggest that black men still have huge power issues when it comes to black women, who have more often than not been more successful at navigating white society than they have. The movie just hints at these things. It’s tag line is, “Let the mind games begin,” and it never really gets beyond this pop-psychology level, maintaining its entertaining fluffiness to the saccharine end, probably as it should. But these relational troubles aren’t just mind games. They arise from social structures and from an American history and culture deeply stained by what many have called our country’s great, original sin. Men may be simple on some levels, but, whether man or woman, race ties every American’s hands and tongue and psyche into to unbelievably complicated knots. This entry was posted in Diversity & Multiculturalism, Reviews & Commentary and tagged Act Like a Lady--Think LIke a Man, Black Men: Obsolete-Single-Dangerous?, black relationships, Black Writers, Black Writing from Chicago, black-white relationships, feminism, Haki Madhubuti, movie reviews, racism, relationships, Reviews by Richard R. Guzman, Steve Harvey, Think Like a Man, traditional relationships. Bookmark the permalink.